Other Products by ATP Science. Search other Multivitamin and Mineral products. Vitamin and mineral deficiencies can create road blocks in certain pathways and if deficient it can be impossible to force the body to change. Vitamin and mineral cofactors are necessary for every system in the body to work, Multi Food can provide these in a natural, non-synthetic way. 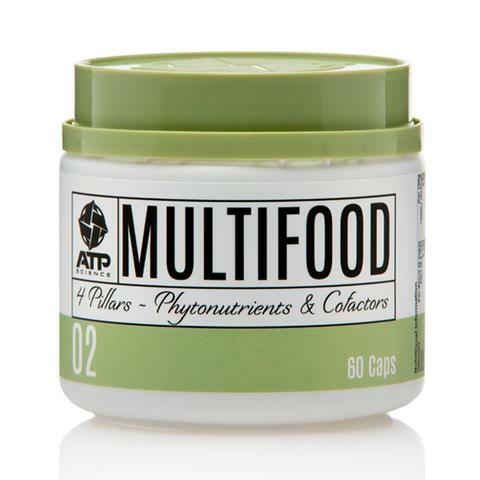 ATP Science MULTI FOOD provides your body with a natural balance of nutrients. Not just the vitamins and minerals; but also the included phytonutrients, polyphenols and other plant based nutrients that are missing in your standard multivitamin. Take 3 capsules daily with food. Capsules can be opened and sprinkled onto foods or added into juices or smoothies as desired. INGREDIENTS: (Guava leaves and fruit, Phyllanthus emblica, Wrightia tinctoria, Lantana camara, Holy basil, Lemon peel, Moringa oleifera, Sesbansia grandiflora), Saccharomyces cerevisiae var, boulardii, rice extract, rice concentrate, Hypromellose, Anatase.